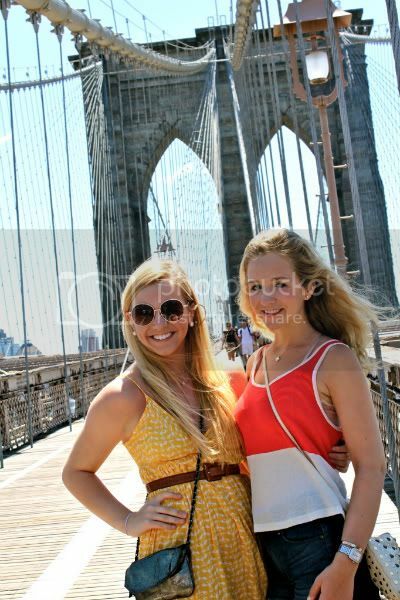 There's always those overrated touristy things that you feel like you have to do but deep down you'd just rather not. Yet, in fear of returning home and people gasping for air when they hear you didn't do such thing (i.e. take a ferry to the Statue of Liberty, go to the top of the Eiffel Tower, or take a picture with the Hollywood sign), we do them anyway. 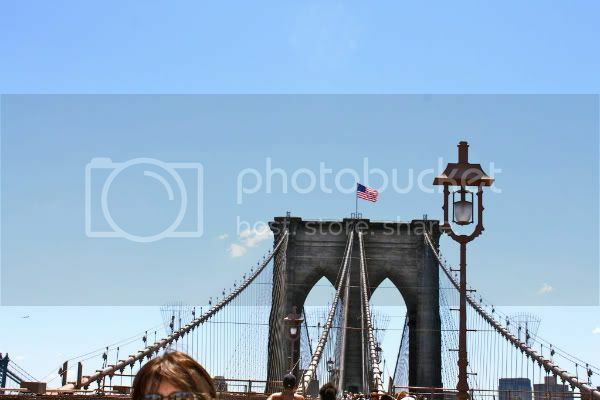 I'm here to tell you that walking across the Brooklyn Bridge is not one of those things. We were lucky enough to have the kind of weather we only see two weeks of the year in Houston. Low seventies, sunshine out, and a perfect breeze. It's an easy (and free I might add) way to have access to a beautiful view of the skyline. 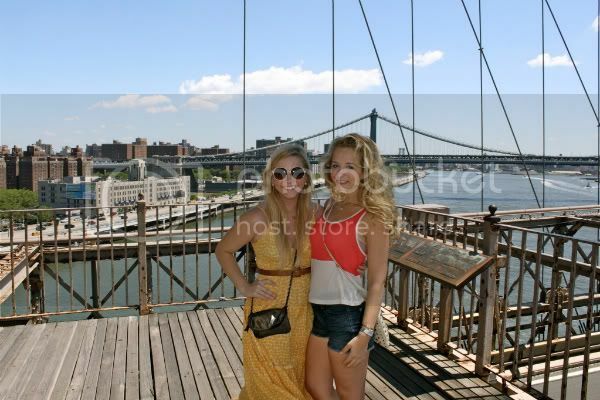 It's a prime location for a vacation photo-op, as you can see we took advantage of. And the perfect amount of walking to work up a healthy appetite. 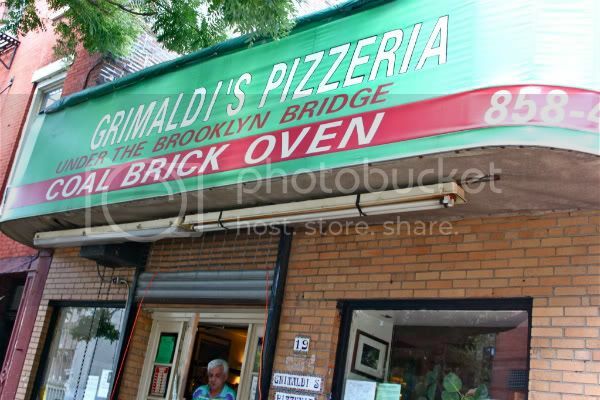 So it's no wonder that the most well-known pizzeria, Grimaldi's, has their original location right under the bridge in Brooklyn (as their signage so proudly declares). You can see the owner stepping out to summon the next lucky diners inside after waiting in a line for what could be up to an hour. The food gods must have been on Mol and I's side that day because we got in in less than five minutes since we were just a pair. 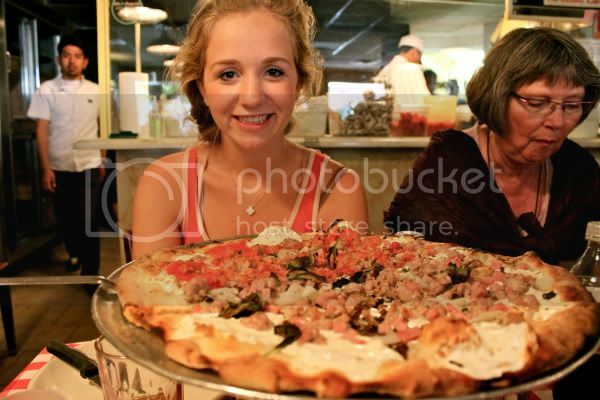 I never have been a pizza fanatic (though my partner in crime is! ), but I will say this meal may have changed my outlook on the pizza pie forever more. We polished it clean without a mushroom or onion to spare. We took the minimal amount of time we had to explore Brooklyn while traversing back to the closest subway station, and Mollie and I agreed that though it's not on the mainland, Brooklyn would be a cozy neighborhood to call home (and you may get a few extra square feet for your buck). Back at the apartment, I had to say my hellos and my goodbyes. 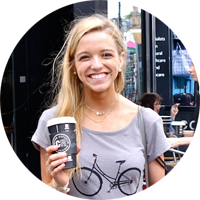 My sister, Erin, has just arrived while sadly, Mollie was making her way home. Up next: an episode of Sisters in the City.